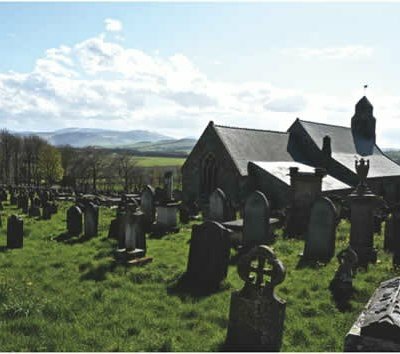 Being the closest chapel to his camp, it is highly likely that King James IV attended Mass in the Church of St. Michael & All Angels before the battle. Originally built in Norman times, it was significantly enlarged in the 19th century by the Newcastle architect John Dobson. The current appearance of Ford Castle dates from the 18th century. However in 1513 it comprised four towers linked by a curtain wall. The home of the Heron family, it was captured by King James when he set up camp on Flodden Ridge. Legend has it that James found the company of Lady Heron to be very congenial and that he slept his last night in the castle. It is also held that Lady Heron had contact with the English army and may thus have been instrumental in influencing the outcome of the Battle however there is no evidence to support this. 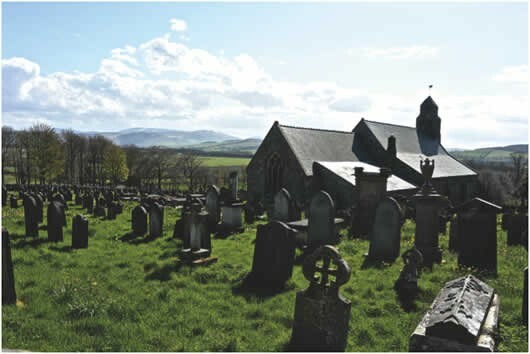 FORD CHURCH sits in a magnificent setting with a fine view of the Cheviot and Flodden Hills from the porch. The building dates from the 13th Century and has always been associated with Ford Castle and whoever owned it. The west wall and the arcading of the south aisle are original, most of the remainder belongs to the well-executed 19th century restoration and enlargement (north aisle) by the renowned Newcastle architect John Dobson. There is an unusual grave slab with bagpipes on it by the west wall close to the entrance door. Also in the churchyard is the grave of Louisa, Marchioness of Waterford who lived at Ford Castle during much of the 19th century and had the Lady Waterford Hall built (as the village school) and therein painted the murals of biblical stories to instruct the children. FORD CASTLE is a Grade 1 listed building and a Scheduled Ancient Monument situated at a shallow crossing point on the River Till, Ford, Northumberland, England. The castle dates from about 1278. The owner Sir William Heron was granted a licence to crenellate the castle in 1338. It was captured by the Scots in 1385 and dismantled by them. However by the beginning of the 16th century it had been rebuilt and refortified. It was taken by James IV of Scotland before Flodden. The castle passed from the Heron family to the Carr family by marriage in 1549 and again by marriage passed to Sir Francis Blake of Cogges, Oxfordshire in the 1660s. Blake built a substantial mansion in Tudor style within the castle in 1694. On Blake's death in 1717, the Ford estate passed to the husband of his late daughter Mary and then in 1723 to her son Francis Blake Delaval. In 1761 John, the 1st Baron Delaval, built the Hall with the assistance of architect George Ruffield in a Gothic style. On his death the property passed to his grand-daughter Susannah who had married the Marquess of Waterford. In 1862 Louisa, Dowager Marchioness of Waterford, widow of the 3rd Marquess, restored and substantially re-modelled the Hall. The castle was acquired in 1907 by James Joicey, 1st Baron Joicey and it remains in the ownership of his family, although since 1956 it has been leased to Northumberland County Council as a Young Persons' Residential Centre. Ford Church is accessible every day from 8 am until 6 pm. Ford Castle is not open to the public. Free admission into Church. Donations welcomed. Follow link above for information about facilities in nearby Ford village. Sensible car parking at the Church entrances. Plenty of car parking is available in the village. Ford Church lies on the B6353 at the Western edge of the village. From Wooler - follow the A697 north through Milfield. After 2 miles turn right on to the B6354 (signposted for Ford and Etal). Follow the B6354 for 1.5 miles, before crossing a bridge and coming to a T-junction. Turn right to Ford - the Church and Castle are on your left before you enter the village. From Berwick - take the B6354 off the A1 and head south-west for 6 miles through the small villages of West Allerdean and Duddo. Stay on the B6354 through Etal and at the River Till junction go straight on following the B6353 to Ford. The Church and Castle are obvious on the left just before you enter the village of Ford.